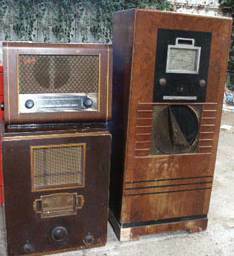 Cossor AC Superhet UK 1935 I acquired this sorry looking wireless set (see below).The loudspeaker had come adrift and broken the rectifier valve and the worm eaten wooden cabinet had housed a family of mice and a wasp nest. 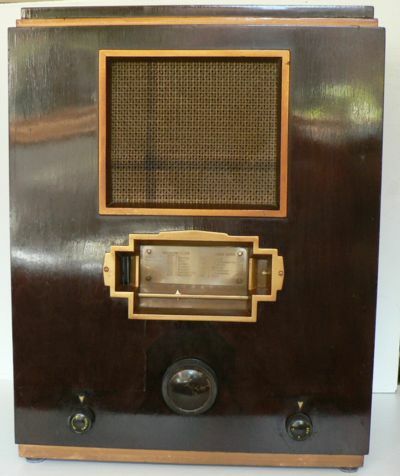 This is one of three radios given to me by Mrs Vollmer, a friend of Mrs Nightingale the lady who gave me six other radios which belonged to her late husband. As can be seen they were all in a very sorry state and were destined for the tip. 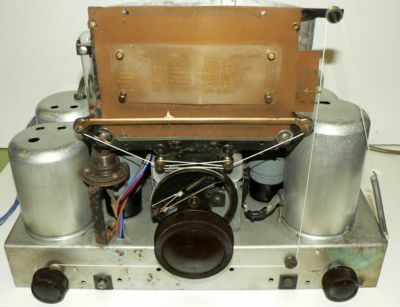 I have been unable to find any information on this radio but it has some features of the model 364 and some of the model 535. The valve lineup would have been 41MPG, MVS/Pen, DDT, XP4, 442BU and 3180 neon tuning indicator. 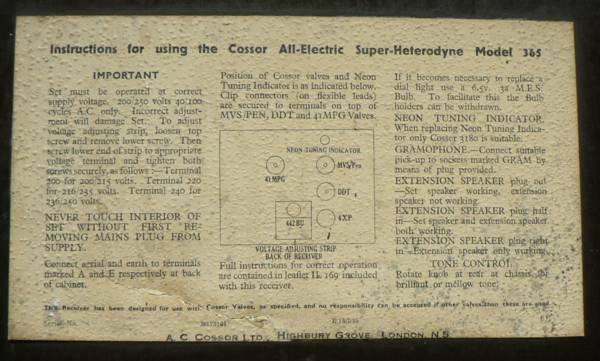 The set was fitted with equivalent valves from various manufacturers as follows MX40, MVS/Pen, TDD4, PX4, IW4/350.The loudspeaker, field coil and its transformer appeared to be OK as did the mains transformer. 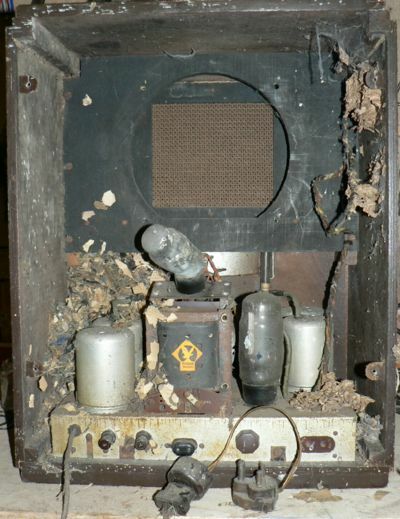 The shredded paper from the mouse nest appeared to be more than 40 years old so I guessed that all that might have been wrong originally was that the speaker had sheared its fixing rivets and smashed the rectifier. I was intrigued to have a set with a directly heated triode output stage and one with such a popular pedigree see www.px4.org/ so decided that it would be a worthwhile challenge to get it working. The first job was to remove the detritus left by its past inhabitants, remove the chassis and treat the cabinet with woodworm killer. After removing the valves and washing them I removed the grime and rust from the chassis. The steel chassis was covered with a thin coating of silver coloured paste (used for renovating picture frames) applied with an old toothbrush and a piece of cloth. In UK this is called 'Goldfinger' and manufactured by Rowney. The cylindrical barrels on the wave change switch were distorted and covered in a white powder which seems to have been caused by moisture reacting withe the insulating material. 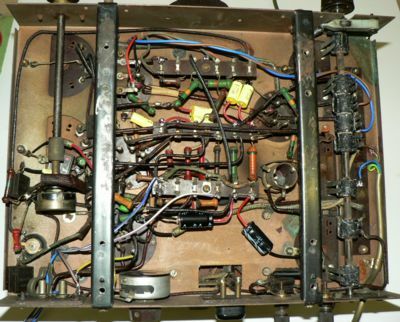 Washing, scrubbing, filing, gluing and lubricating got the switch operating reliably. 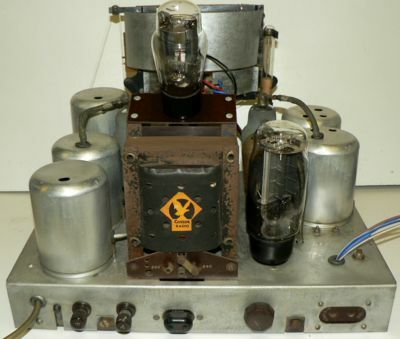 The yellow non-original electrolytic capacitors and the low voltage electrolytics were found to be virtually short circuit and were replaced. Application of an external 120volt DC supply revealed that many of the paper capacitors were leaky so these were replaced as well. 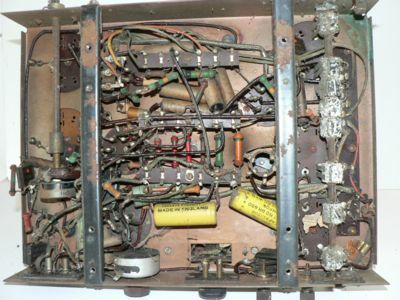 The small variable resistor associated with the neon indicator was open circuit at one end so this was rewired to utilise the opposite end and the track on the volume control was cleaned. A new mains cable (with earth connection) was fitted and the wires to the speaker and field coil were replaced. 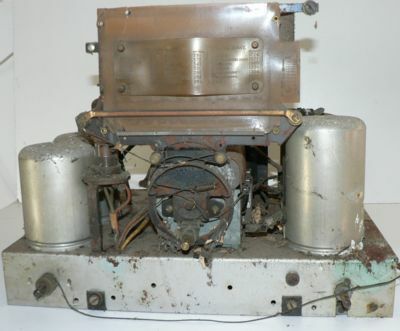 The three gang variable capacitor was covered with a rusty steel cover. To remove and clean this I had to dismount the capacitor. In doing so I found that in several positions the vanes touched and needed some careful tweaking (the fixed and moving vanes are die cast). When reassembling the dial drive it is necessary to ensure the that the vanes do not fully mesh or else they will short against the fixed ones! Here we see the dial which over the years has shrunk and caused the removable station indicator to buckle. I managed to improve the situation using very hot water and a heavy weight and then elongating the holes through which the four brass fixing screws pass. Behind the dial are three separately illuminated compartments (6V 0.3A) which can be seen in the second picture above. Nothing went bang when I energised the set without the rectifier in place, all the valves lit up so I inserted the rectifier and slowly brought up the voltage using a variable voltage transformer and 'lo and behold' at about 190 volt I hear music! 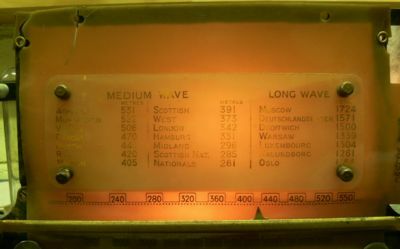 At full voltage the set works both on long wave and medium wave, it has been worth the effort. At the moment the neon indicator does not seem to function. 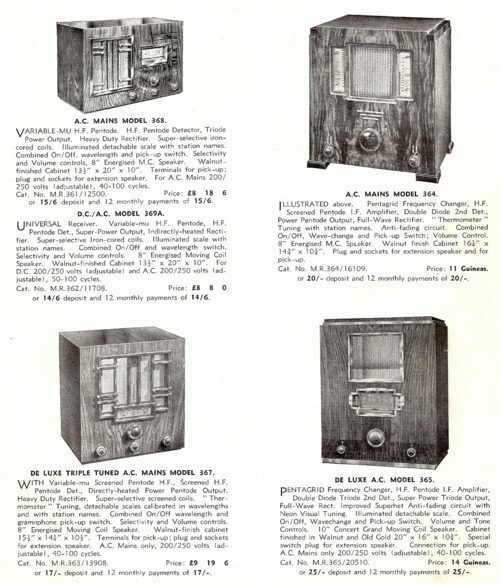 A page from a trade catalogue of 1934.